(New York, New York – June 8, 2018) – Multi-platinum global reggae-pop quartet MAGIC! 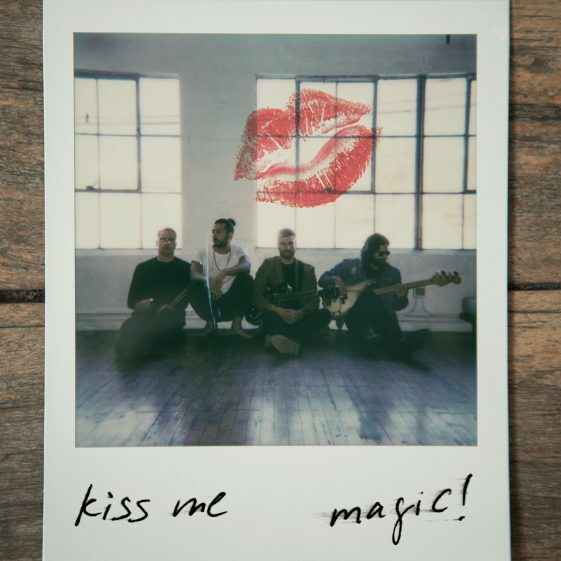 is back with their latest single and music video for “Kiss Me” today via RCA Records (Click here to watch). The track was written and produced by MAGIC! and Adam Messenger. MAGIC! is composed of Grammy Award-winning songwriter/producer Nasri (lead vocals), Mark Pelli (guitar), Alex Tanas (drums) and Ben Spivak (bass). The band made their mark with hit single “Rude”, released in 2014 before exploding into viral popularity. Holding the #1 spot on Billboard’s Hot 100 chart for six weeks, “Rude” simultaneously dominated the charts globally, hitting #1 in 41 countries. The track has been streamed nearly 500 million times on Spotify and the upbeat, quirky video for the single has seen over 1.3 billion VEVO views. MAGIC! has released two studio albums, toured with Maroon 5 and headlined shows all over the world. They have received two JUNO Awards and received multiple nominations including American Music Awards, Billboard Music Awards, Teen Choice Awards and more. They are currently in the studio putting their finishing touches on their third studio album expected out this fall.